The kitchen is the most important room to stage in your home. Potential home buyers will want to view it void of unnecessary countertop appliances and clutter. By showcasing your kitchen in the best possible light, you can potentially sell your home faster and increase the closing price. Even in a slow real estate market, making your kitchen attractive to a buyer could make the difference. Studies have shown that one of the dirtiest places in the home is the kitchen. Before you list, pull out those rubber gloves and give everything a good scrub so that the kitchen sparkles. Replace unsightly floor tiles, or in a worst-case scenario, consider a complete floor makeover. Pay special attention to the cabinetry; in older homes, it is common to see cracks in the beaded caulking between the ceiling and the trim above the cupboards. For less than $10, you can buy a pre-mixed tube of crack filler and make it look like new. Also, to give the kitchen an inexpensive facelift, consider replacing the fixturing – an affordable way to give doors and drawers a second wind. Kitchens are the focal point of almost every home. A great rule of thumb for the staging of a kitchen is to leave no more than two appliances on your counter. After you have uncluttered the kitchen counter, brighten and soften the space by adding some fresh fruit, new dishtowels, a cookbook, and plants or flowers. Modernizing your kitchen can help you sell your home for years to come. Renovating your kitchen now will let you enjoy new appliances while boosting the value of your home for the future. 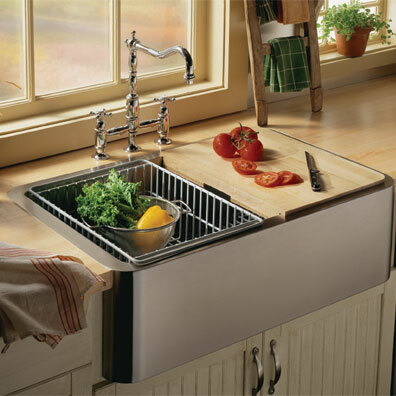 While you may want to take specific appliances with you, stainless steel can make almost any kitchen sing. Another way to add value to your kitchen is to install concealed appliances – hiding the dishwasher and fridge, for example, can really spice up your kitchen for buyers. Also popular are dual microwave/convection oven (prices can vary between $200 - $900 for higher-end stainless built-ins) – another appliance quickly becoming a staple in most modern kitchens. If you can’t replace appliances, be sure to have them repaired and cleaned. It’s also a good idea to clean your fridge and stove, as buyers will almost always open oven and fridge doors. Take the time to make sure all the existing light fixtures have working light bulbs. Make sure the blinds are open on all the windows and, if required, add a small table lamp or two to accent a dark corner. Another kitchen remodeling idea is to upgrade your “sinkware.” New faucets, soap dispensers and sinks (whether you are reglazing or replacing altogether) are affordable ways to give the kitchen an immediate facelift. Don’t forget, buyers love to turn on the kitchen faucet when touring a home. The kitchen is the most important room and biggest selling feature in your house. Staging it properly can make every potential buyer say, “this could be my kitchen."